The author depicted the kissing rite – a ritual by which the hosts honored their guests by expressing their respect for them. The appearance of this ritual dates from about 15 – 17 centuries. After a rich lunch, the host’s wife went out to guests with her daughters and servants. For the ceremony, she dressed up in the best outfits and jewelry in order to give guests a cup with a drink. Leaning her lips against the cup, she gave it to her guest. After the guest drinks the contents, he needs to kiss the hostess and her daughters on the cheek. The artist is very accurate, pronounced and vividly depicted the ritual. The picture is written in bright and bright colors. The actions described in the picture take place in a luxurious hall. In the center of the plot is a festive table at which the owner of the house sits and his guests. Apparently, the feast comes to an end and it’s time for the ceremony. The host’s wife and her daughters stand by, trying not to look up at the guest of the house, they are ready for the ritual kiss, while the guest is already reaching for a cup filled with drink. Husband and his entourage are closely watching women. 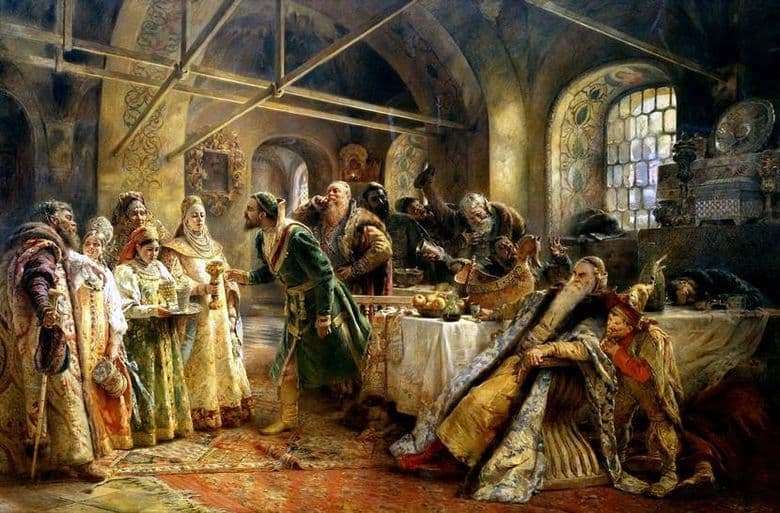 Makovsky painted an amazing picture, a masterpiece in Russian painting, which was admired and will be admired by many generations after us.